Camping Part 4: Day 1 ...What we have to change in the tent? Wow, it's Wednesday already. I bet y'all thought I got lost on the trail somewhere and forgot to come back to tell you about the rest of our vacation! I didn't. It just got a bit busy here and I've not been able to make the time to write. Now, where did I leave off? Oh yes, our very first camp fire. Well, I have to say that it was wonderful. I had so much fun teaching the boys how to build one and about camp site safety. Yep, I'm a teacher even when on vacation. I turn everything into something educational. My poor kids, eh? 1. We had talked about this many times. 2. They had loaded all of their things into their tent and laid it all out how they wanted it. 3. Umm...Ok, maybe just a couple of reasons. Surprisingly, it didn't take them too long to get settled down. What amused me the most was their shock that I expected them to change their clothes inside the tent. Now, before you think they're a couple of nudists (trust me, this was the 1st summer I could convince them to run around without shirts on! ), they expected to haul their things to the bathroom and back. The next morning, we all got up and after a breakfast of cereal and fruit, we decided to head down to the beach. Wow, that walk was a lot further than it appeared! We walked over wood chips. We walked over boardwalk. We walked over sand. We finally got to the beach! There, we sat down on the one bench and slathered sunscreen all over us. I was not repeating last years' sunburn. Then, without warning, I heard ow! Ow! Mooom! Ow! It seems that not only do mosquitos love Ben, but so do biting flies. They were all over his legs! How do you get rid of biting flies? You get in the water! Or you try to...except in my case, I had a Ben hanging all over me. He's afraid of the water, you see. His balance is off and he's afraid that if he falls down, he's going to drown. We had purchased a life vest for him and he had it on but the waves are so much stronger in Lake Huron that it really made him nervous. I spent most of my time in the water (which was pretty cold if I haven't mentioned that) standing with him while Justin and Roger went out into deeper water and had a good time. Eventually, I convinced him to sit down in the shallow water and enjoy the feeling of the waves while I swam around for just a little bit. Those are the harder moments because I feel like a bad mom for wanting a few minutes to enjoy the water myself. On top of that, it's not terribly unusual for Justin to get frustrated and walk off by himself for a few minutes. Please don't think he's a bad guy. He's really not. It's hard having a special needs child. It's hard when you haven't had 11 years of experience. Heck, it's hard for me sometimes. I get frustrated. I'm human. We both are. Trust me, when you're tired, a lot of things can be frustrating. He's wonderful with the boys. He honestly is. Ok, enough of that side bar. After a while, the beach started to get crowded and we decided we were ready for an early lunch. Much to the dismay of my children, I refused to light another fire and instead we had sandwiches, pasta salad, fruit, potato salad and other goodies for lunch. Then, out came our brand new WWE Uno deck. Why did I point out the branding? Only because there was a near brawl in Meijer as the boys discussed which Uno deck we should get. Ben (avid WWE fan) wanted that one. Roger, my mini me, wanted the cheapest Uno deck. After all, he pointed out, they all play the same way. In the end, to compromise, we bought the WWE one but Ben had to use his money to pay the difference in prices. Whew! Fast thinking Mama! So, UNO or is it Uno (why do I honestly care?) was played around the picnic table and then...wait for it...it started to rain! Ahhh! So, I chased the boys into the tent and Justin and I quickly rounded up anything that we didn't want wet and hid it in the back of the van before joining the boys in our tent. After further attempts at completing our Uno game, we gave up and just hung out in the tent for a while. Oh wait, I almost forgot! Roger suggested we play Life on the iPad so we did knock out one game of that. It seems to me that I had filled up my car with kids and was about to need a second one before we finally finished. It's a cute app but just not the same as the real game. Luckily, the rain let up not long after that and our wood hadn't gotten wet so we were still able to make pizza for dinner. I have to say that they were mighty tasty! Of course, before bed, the boys made us sing their one and only camp song again. Remind me to teach them a few more before next year, please! Tune in next time to hear Spongebob me say...How did your shoes get all wet anyway? and It's how far to Walmart?!? 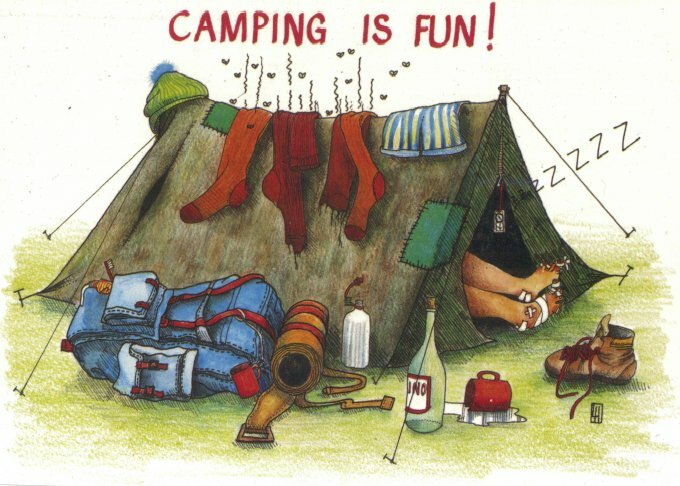 I change clothes in my tent all the time ... which is hard to do because of my back (I can't quite bend and balance). Was this the boy's first camping trip?